Eco Spas is one of the most popular, fastest growing hot tub companies. We welcome you to explore our site and see for yourself what makes us so special. Hot Tub Warehouse is the leading provider of Eco Spa Hot Tubs to Sacramento and Northern California, Portland and greater Oregon, throughout Seattle and Washington state, Tennessee, and Montana. Let us help you choose the best hot tub or eco spa. The hard cover system with exclusive power seal technology is 25% more efficient than the average vinyl cover. In addition to spending quality time with your family or loved one, there are many health benefits to owning your own quality hot tub or spa, including better sleep, stress relief, back and knee pain relief, relief from muscle aches and soreness, and soothing relief for arthritis pain. 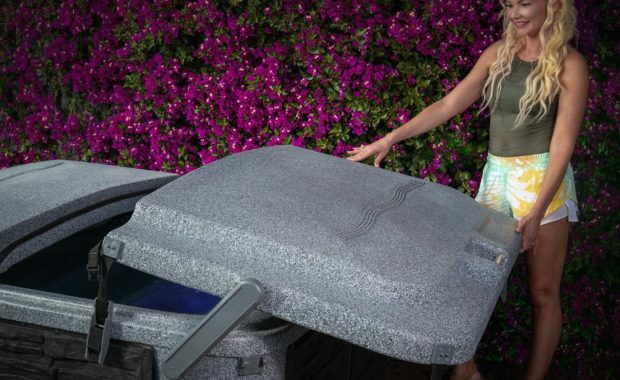 From our smallest two-person spa to our larger four-person spa, you will find Eco Spas to be the most unique, energy efficient, and well designed hot tubs on the market — and engineered to fit any lifestyle. Let us help you find a high quality, energy efficient, and affordable spa. "Thank you for the wonderful service you always give when I call! You always remember my name and make me feel like your #1 customer. I love my spa. I have had it for almost two months and have gone in it every night… rain, snow, or sun. I look forward to talking to you again. Thanks for the great service!" "We are excited to purchase an Eco Spa! I have reviewed the Eco Spa brochure and am pleased with the product and service. I was originally going to purchase a hot tub from Costco, but I am glad we didn't. The customer service and your delivery crew were great." "Eco Spas delivered everything as promised. The process was simple and easy. We are so happy with our purchase." "We absolutely love our spa! The service from start to finish has been impeccable. This hardcover is incredible! The delivery crew was fantastic. We have had our spa for three years now and have not had one problem. Every time we have a question all we have to do is call the office. We love Hot Tub Warehouse!" "Been in my hot tub every night since the first night. Love our hot tub. The two guys that delivered the spa were courteous and cleaned up. We are really enjoying the spa! Amanda is always quick to respond to our calls and we never have to worry about this spa — best decision we ever made." "The folks at Hot Tub Warehouse are fabulous! We came across their display at the Home and Garden show and they were extremely helpful, explaining why the Eco Spa is a great product without any sales pressure. From sales contract to delivery, and now maintenance, Dave and Amanda have been incredible. They are thorough and patient, taking the time to answer my questions. I drive the extra 45 minute to their shop to buy my products because they really know their stuff." "When I was in my fantastic spa today, I decided I needed to take a minute to thank you again. You have really changed the quality of our lives. The relaxation and comfort you have allowed us to enjoy is remarkable. Thank you for making the process so flawless and for the great product you provided."